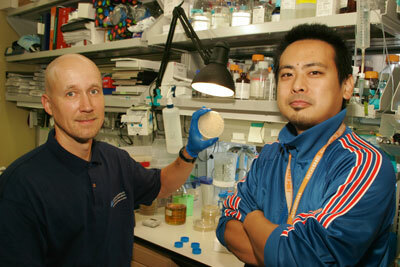 (Nanowerk News) Scientists at UC Santa Barbara have discovered a potential new drug delivery system. The finding is a biological mechanism for delivery of nanoparticles into tissue. The results are published in this week's Proceedings of the National Academy of Sciences. "This work is important because when giving a drug to a patient, it circulates in the blood stream, but often doesn't get into the tissue," said senior author Erkki Ruoslahti, of the Burnham Institute for Medical Research at UCSB. "This is especially true with tumors. "We believe this method will lead to better, more efficient delivery of drugs," he said. In this study, the scientists used prostate cancer cells as their target, but the method could apply to any type of cell. The scientists developed a peptide, a small piece of protein that can carry "cargo" for delivery into the cell. The cargo could be a nanoparticle, or even a cell. Riding on the peptide, the cargo gets out of the blood vessel and penetrates the tissue. The drug is located at one end of the peptide. At the other is the "C terminal," which has the "motif" –– an amino acid sequence including arginine or lysine, that causes the tissue penetration. This terminal has to be open, the researchers found. The strict requirement for the C terminal led the group to coin a new name, the "C-end rule," or CendR, pronounced "sender." Ruoslahti explained that another exciting aspect of the study is the discovery that viruses appear to use this "CendR" system to get into cells. "It's a natural system," he said. "We're not quite clear what the exact function is, but viruses appear to take advantage of it." Ongoing research in the Ruoslahti lab is understanding how viruses use this system, and then working to develop inhibitors to prevent viruses from entering the cell. The two first authors on the paper are Tambet Teesalu and Kazuki N. Sugahara, both of the Burnham Institute for Medical Research at UCSB. Third author Venkata Ramana Kotamraju, of the same institute, made the peptides. Ruoslahti is also affiliated with the Burnham Institute for Medical Research in La Jolla, Calif.